I have a limited number of cookbooks in my kitchen library. I rarely cook from recipes unless it’s something I’ve never attempted before. Once or twice is fine, after which I’ll file it away in my mental Rolodex. I prefer recipes that aren’t overly complicated and don’t require hours and hours of slaving away at the stove. Most of the home-cooked meals I’ve photographed for the blog reflects this preference. Simplicity, both in technique and number of ingredients is what I strive for. Occasionally I’ll pull out all the stops and prepare an extravaganza but that’s far and few between. I think the ability to self-edit is important. Too often — and I see this all the time on Food TV and shows like Top Chef — people will throw in everything but the kitchen sink. The sentiment must be that if A + B tastes good, think of how much better the dish could be if we add in C and D. Complexity is okay, but there is a point after which it becomes a joke. One of the projects I have for 2008 is to try to cook more seasonally. That means I’ll be using locally grown produce, vegetables from the Greenmarket and as few processed crap as possible. The latter isn’t difficult. I don’t keep any junk food in the house apart from a tub of Haagen-Dasz. I’ll probably get an ice cream maker for Christmas this year after which my transformation will be complete. The ingredient list for tonight’s dinner looks scary but don’t let it fool you. 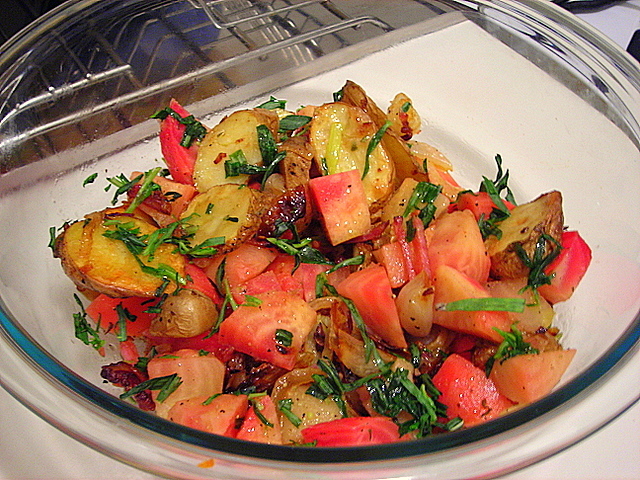 The salad has a number of components that need to be prepared separately. I’ve broken things down into easily digestible chunks. Total prep time for tonight: 90 minutes. Preheat oven to 375 F. Place beets in a glass baking dish, along with 1/4 cup water. Cover tightly with aluminum foil and roast for 45 minutes to 1 hour or until beets are easily pierced with a fork. Set aside. When cool enough to handle, peel and trim beets, then cut into 1/2″ dice. Season generously with kosher salt and cracked black pepper. Drizzle with 4 T. white wine vinegar. Toss. Set aside and marinate for 30 minutes. Season potatoes and shallots with kosher salt. Drizzle with extra-virgin olive oil. Roast at 375 F for 45 minutes or until vegetables are golden brown. Fry bacon until desired doneness. Place on paper towels and set aside. When cool enough to handle, julienne bacon and set aside. Drain off most of the fat, reserving 3 T. drippings. Saute onion in bacon drippings over medium heat or until caramelized. Reserve half of the onion for the omelette filling or another use. For the dressing: Whisk together vinegar, olive oil, sugar and mustard. Check seasoning. Add tarragon 1-2 minutes before service. Assembly: Place beets in a serving bowl; discard marinating liquid. Add potato mixture, bacon and half of the caramelized onion. Toss. Drizzle 3-4 T. dressing and pass the remainder at the table. Garnish with chopped tarragon. 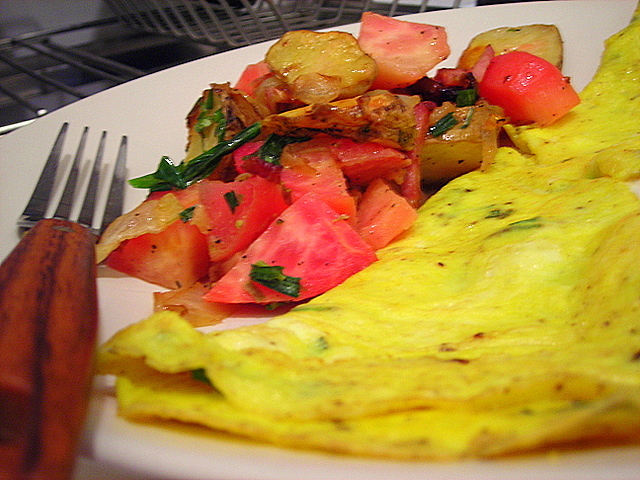 The omelette is a simple 3 egg omelette (2 t. cold water, salt, pepper, herbs) prepared in 1 T. unsalted butter. When eggs are set, add reserved caramelized onion and fromage blanc. Cook for 1 more minute, fold, and transfer to a warmed platter. Serve immediately. 13 Mar	This entry was published on March 13, 2008 at 3:52 am and is filed under food, general. Bookmark the permalink. Follow any comments here with the RSS feed for this post. You and I cook alike. Recipes used for the unfamiliar, totally off the top of my head most times. There comes a point where intuition takes over, and food is made better. Simplicity is often a key ingredient. The ice cream maker is one of my favorite guilty pleasures, and I have two. The old cedar bucket hand crank one, and the new Cuisinart. The latter is extremely easy to use, and the results are fabulous. Last night I picked up a tub of adzuki (red bean) ice cream. I had a craving for peanut butter chocolate something but subtlety won out. Instinct in cooking demands that people have a grasp of the basics. I’ll talk about this more in another post. I think what I’m really objecting to is food that’s masked by a multitude of flavors rather than speaking of its essence. Don’t you think the “deconstructed” thing has been done to death? Well, if it were restaurant food I’d agree with you. Like other fads — molecular gastronomy, tall food, nouvelle cuisine and plate painting to name a few.